The article is split into two parts, one about how to rip DVD to Xbox One video on PC/Mac, the other on transferring DVD video to Xbox. 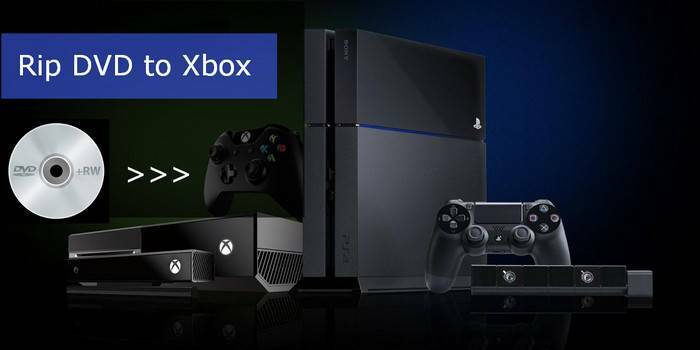 Xbox One is the successor to Xbox 360 and quite a competitor of Sony's PS 4 (PlayStation4). It runs an Xbox OS, a Windows kernel based OS and another OS simultaneously. Because it is only a game console, it does allow playing DVDs thereon, but it supports watching videos. 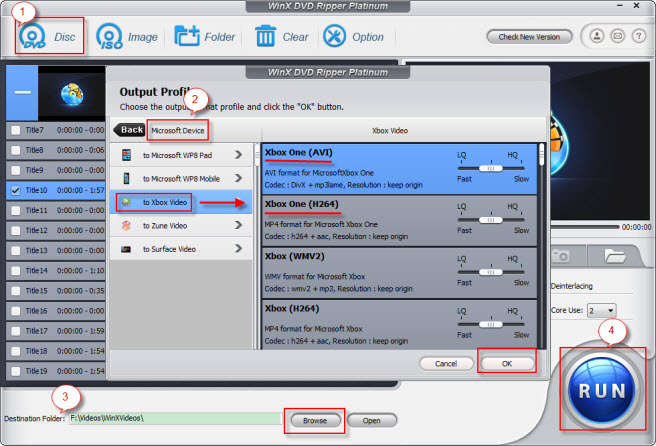 - A fast DVD to Xbox DVD ripper for Windows and Mac It can convert DVD to AVI, MP4, WMV, MOV, 3GP, etc., and help play DVD movies on Xbox One, iPhone, iPad, iPod, Android, mobile phones, pads, PSP, smart TV, and so on. After downloading the DVD ripper, please feel free to install it following the installation Wizard, and run it whenever you want. Then follow the guide below to rip DVD to Xbox One and play digital files ripped from DVD on Xbox One directly. Insert a DVD into your DVD-ROM, and click "DVD Disc" button to let the software recognize and analyze the DVD. It takes just a few sec. That means you can convert DVD to either an AVI or an H.264/MP4 video with Xbox's resolution and Aspect Ratio. This is an optional operation needed only if you want to change the default folder and disk to save the output file. Just Browse to choose the Destination Folder. Simply click the RUN button then the software will start converting the DVD to Xbox One video. 2. Copy the DVD movie media file to a USB flash drive and play it on Xbox One. Using any one of the methods above, you can play DVD videos on Xbox One free without buying videos on Xbox Live. Please note that WinX DVD Ripper Platinum and WinX DVD Ripper for Mac can also rip and decrypt a DVD (disc, ISO image, folder) to Xbox 360, DVD to WP8, Surface tab, Zune (HD), and more on Windows PC and Mac. The fastest DVD ripper software: rip the DVDs to a wide range of mainstream video formats, such as AVI, MP4, MPEG, WMV, MOV, FLV, AVC, TS, MTS, M4V, etc. Users can also rip DVDs (even encrypted DVDs) to iPhone, iPad, Android and many other devices. Detailed guide on how to play (background) music on Xbox One X/S while playing a game. The best free music downloader program will be also introduced. To play a DVD on iPhone is seeminlgy impossible due to the lack of DVD drive and MPEG2 decoder which are essential for DVD playback. For Mac users, problem always arise because of the particular Mac OS X, since not all the software have the matching Mac editions.